Based on David Mamet’s play Sexual Perversity In Chicago, Steve Pink’s About Last Night – also a remake of the 1986 rom-com starring Rob Lowe and Demi Moore – attempts to provide a modern spin on the trials and tribulations of romantic relationships for 21st century audiences. Yet instead of saying anything new or interesting, the film rehashes every single cliché known to man – and not even in a way that’s mildly distracting. Strung along on a double date by their respective best friends, Danny (Michael Ealy) and Debbie (Joy Bryant) click in ways neither of them expected, with their passion for one another quickly escalating from one-night stand to meaningful romance. However, it’s not long before various pitfalls present themselves and the twosome must decide whether what they have together is, ultimately, worth fighting for. If the above plot sounds in anyway conventional, it’s because it is. Despite boasting a script from Bachelorette writer Leslye Headland (an extremely funny comedy that was criminally overlooked upon its UK and US release last year), About Last Night – and, in similar respect, the central relationship between Danny and Debbie – never ventures far from the beaten track of its overdone rom-com architecture, with every cliché struck abating its own value. What’s more, it doesn’t exactly help that there’s little to no chemistry shared between lead stars Bryant and Ealy. As a result, the ups and downs their characters’ relationship experiences over the course of the film’s 100-minute runtime are not only foreseeable, but downright wearisome. 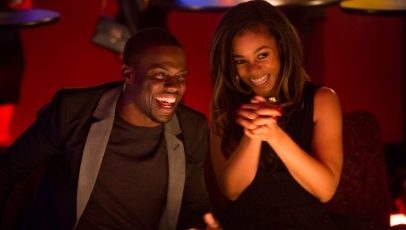 For no other reasons than the fact that they provide welcome dose of entertainment, Regina Hall and Kevin Hart are well cast as Danny and Debbie’s forever bickering, will-they-wont-they best friends. The film ticks by at a monotone pace, and some pizzazz shines through as a result of the sophisticated downtown LA setting, making for a welcome change to the usual drab surroundings found in rom-coms. But none of these positive elements amounts to anything more than a mild distraction. For a film that tries desperately hard to be fresh, trendy and attractive, About Last Night is slapdash, wishy-washy nonsense.